The St. Columba’s GAA Football team arrive at St. Columba’s National School, led by Conán Brady and Shane Mulligan Capt. Co.Longford yesterday. A few weeks ago we offered the opinion that the club championship economy car was beginning to fall too easily into the slipstream of the inter-county juggernaut. The spread at club level could never be as narrow or pronounced as it is at inter-county level but a few teams were making a habit of returning on a repeated basis, pointing to the formation of a new cartel. On one weekend Kilmacud Crokes, Dr Crokes and Corofin, the champions of Dublin, Kerry and Galway (all current provincial champions) put the champions of Meath, Cork and Roscommon, traditionally among their biggest rivals at inter-county level, to the sword by a cumulative margin of 64 points. Lurking in the background once more were competition specialists Crossmaglen Rangers, six-time All-Ireland champions. With Na Piarsaigh and Ballyhale Shamrocks positioning themselves in the hurling championship, it had an elite feel to it, one that was leaving very little time for romance. Such an assertion was premature. First, Na Piarsaigh were uprooted by Ballygunner, a Waterford city club it must be said with serious pedigree, then Crossmaglen were scuppered by Gaoth Dobhair, a club laden with Donegal All-Ireland winners and finalists to remove a just a little touch of the elitist veneer. But Mullinalaghta’s success in downing the might of Kilmacud Crokes in Sunday’s Leinster club final brought the house down. It may well indeed be the greatest club story ever told but it has a lot of strong contenders to rival it. It’s only a few short years ago that Mount Leinster Rangers landed a Leinster club title, beating Oulart-The Ballagh in the final before reaching an All-Ireland club final on St Patrick’s Day. Carlow only has a sprinkling of hurling clubs, the county has never won a Leinster hurling title. At least Longford has some lineage to a successful past, winning the 1968 provincial football title. Wicklow have never won a Leinster football title but that didn’t prevent Baltinglass claiming the 1990 All-Ireland title. Kilmurry-Ibrickane and Dromcollogher-Broadford, Clare and Limerick champions, won Munster club football titles in the last decade, beating Kerins O’Rahillys and Nemo Rangers respectively. When Kilmurry-Ibrickane advanced to the All-Ireland final, Antrim champions St Gall’s were waiting for them. 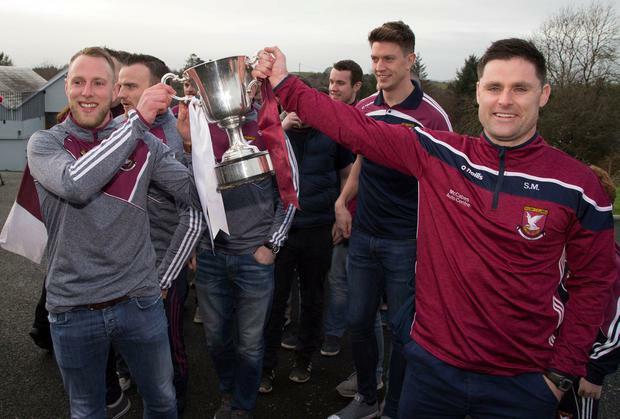 Slaughtneil’s achievement in winning back-to-back trebles or a ‘double-treble’ – 2016 and 2017 Ulster football, hurling and camogie titles was done so with teams drawn from just 300 or so houses in their hinterland. But Mullinalaghta’s story surely outstrips them all now, the absence of a shop in the half-parish the icing on a cake that is already dressed up in paltry numbers, a membership of 155 from a population of around 450. The question is why haven’t the other 295 or so inhabitants signed up! You’d like to believe that Mullinaglaghta’s story will permeate with club teams over the next few weeks, stoke something in them to reach higher and further. The belief that resources, financial and population, aren’t necessary tools at this level will be nurtured in just about every opening speech to 2019. But while a few clubs will look inwards and find something, the effect at inter-county level will be negligible. Nothing laid out the vast gulf between the two levels quite like the fall of the most recent two Dublin champions. Last year Wicklow champions Rathnew took out their Dublin counterparts St Vincent’s in a Leinster quarter-final but when the counties met last May, 23 points divided them. When Longford met Dublin in this year’s Leinster semi-final, the gap was 19. The time of year that the provincial championships concludes is a factor in some of these results; heavier pitches leading to mistakes that an underdog loves to prey on. The conditions for an ambush are right. Ironic perhaps that there’s a clamour to get the club championships finished much earlier. The 60-minute match duration is also relevant. Mullinalaghta have a more shallow bench by their own admission, so would an extra 10 minutes have served them well last Sunday? But the bottom line is to achieve what they have done they must have good footballers. All the unity and defiance in the world won’t get them over the line if they don’t have quality, first and foremost. Two years ago they might have beaten St Vincent’s, last year they should have beaten St Loman’s, this time they saw it out. The county itself has been ambushing more decorated counties in the qualifiers over the last decade. It’s been coming. They got it right at the right time. No one can ever say they aren’t worthy. Maybe Vincent’s time was at an end after a long run but Rathnew made sure of it with a 1-13 to 1-9 win in last year’s quarter-final. Mount Leinster Rangers beat Ballyboden St Enda’s but the Carlow side’s 0-11 to 0-8 Leinster final win over Oulart-The Ballagh really made the hurling world sit up and take notice. Nemo Rangers are the most successful club football team in history with seven All-Ireland titles which made their 2008 Munster loss to Dromcollogher-Broadford all the more sensational. O’Hanrahan’s, living in the shadow of éire óg in Carlow town for so long, enjoy a 1-7 to 1-5 over that year’s beaten All-Ireland finalists.